By sevvy January 27, 2018	 why? 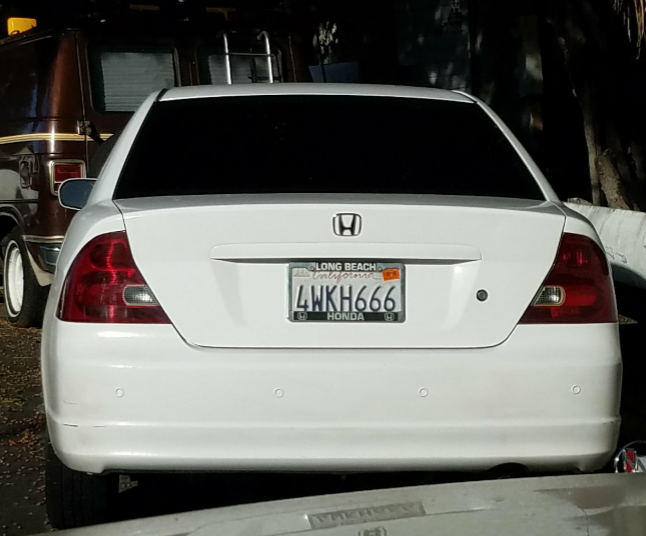 Glendale, Calif. --- This week's Sabbath service at Chevy Chases Adventist Church was interrupted repeatedly with calls for "the owner of a white Honda with 666 plates" to remove the vehicle from church premises. The increasingly pointed appeals started shortly after the Sabbath School mission story and were repeated every seven minutes or so from the pulpit. When Sabbath School ended and the car remained in the church lot, church elders began questioning members one at a time in a hastily converted church office/interrogation chamber. The questioning led absolutely nowhere, regardless of stern warnings that the owner of the vehicle would have his or her church parking privileges permanently revoked unless it was immediately removed. Halfway through the sermon a tow truck arrived. As the offending Honda was finally hoisted off the ground and the tow truck pulled away, a frantic man burst out of the Starbucks across the street and began to chase the truck shouting what one eye witness described as "bad language of apocalyptic proportions." Finally, another one of your infrequent good ones! This one is actually totally realistic. One time I saw a plate with 1844 on it. Should it have been raptured on the spot? In my state I have seen EGW prefix to the numerals. What’s a tried & true, red-blooded SDA to do? I wanted to scratch the fenders! I thinks it is called KEYING. Somebody help me out.Not out of the church. Out of my mid!